Protein stands out as a basic building block for enzymes, cells, organs, tissues, antibodies, and hormones. It is crucial for reproduction, repair, maintenance, and growth. The great news is that you can obtain proteins from many different sources. You have animal-based protein sources like fish, eggs, beef, turkey, lamb, and chicken. In addition, good quantities are available in soy, cereals, and vegetables, even if they are not as good as those from animal sources. One thing that few cat owners understand is that every single protein source will include different amino acids levels. Also, every protein is different as it has a different ability to break down into the much-needed amino acids. To put it simply, proteins are not equal. Some will be better for your cat than others. The big problem is that protein requirements are going to be different from one species to the other. In addition, there are various need changes that appear. For instance, a cat that is during growth stage will need more protein than an elderly cat. As a really simple rule of thumb, a kitten will have to take in 30% of the nutrients as proteins while an adult cat will only need around 25%. Lactating and pregnant cats will need kitten food because it includes more protein and this is necessary during this time. The same thing goes for debilitated, weak and sick cats. All the felines with kidney diseases might need a restriction of protein intake but this is only done after talking to a vet. There is quite a strong debate going on at the moment about the possibility to feed too much protein to your cat. The problem is that a healthy pet will simply just eliminate all the extra protein in urine while some quantities can be stored as fat. Unfortunately, chronic excessive protein feeding can lead to kidney problems. A cat’s diet has to include as much protein as the animal needs. Most premium foods on the market get the mixture right and will offer many different protein sources so that the quality of the protein taken in is always high. 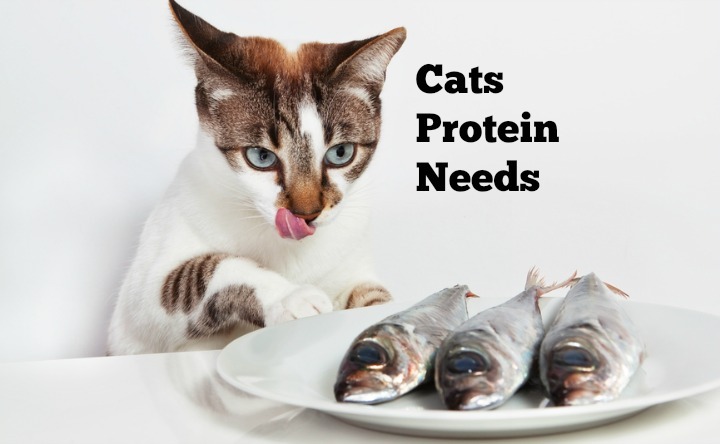 What is really important is to understand at what stage in life the cat is so that you will know exactly how much protein you have to include in the feline’s diet.